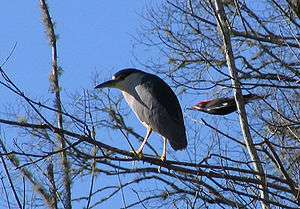 The photo was intended to be of a black-crowned night heron; the photographer was initially unaware of the pileated woodpecker flashing through. Serendipity means a "fortunate happenstance" or "pleasant surprise". It was coined by Horace Walpole in 1754. In a letter he wrote to a friend, Walpole explained an unexpected discovery he had made by reference to a Persian fairy tale, The Three Princes of Serendip. The princes, he told his correspondent, were "always making discoveries, by accidents and sagacity, of things which they were not in quest of". The notion of serendipity is a common occurrence throughout the history of scientific innovation such as Alexander Fleming's accidental discovery of penicillin in 1928, the invention of the microwave oven by Percy Spencer in 1945, and the invention of the Post-it note by Spencer Silver in 1968. In June 2004 a British translation company voted the word to be one of the ten English words hardest to translate. However, due to its sociological use, the word has since been exported into many other languages. The first noted use of "serendipity" (meaning pleasant surprise) in the English language was by Horace Walpole (1717–1797). In a letter to Horace Mann (dated 28 January 1754) he said he formed it from the Persian fairy tale The Three Princes of Serendip, whose heroes "were always making discoveries, by accidents and sagacity, of things they were not in quest of". The name comes from Serendip, an old name for Sri Lanka (aka Ceylon), from Tamil Ceralamdivu, Sanskrit Simhaladvipa and Persian Sarandīp (سرندیپ). Parts of Sri Lanka were under the rule of Tamil kings for extended periods of time in history. Kings of Kerala, India (Cheranadu), were called Ceran Kings and divu, tivu or dheep, which means island. The island belonging to the Chera King was called Cherandeep, hence Sarandib by Arab traders. Serendipity is not just a matter of a random event, nor can it be taken simply as a synonym for "a happy accident" (Ferguson, 1999; Khan, 1999), "finding out things without being searching for them" (Austin, 2003), or "a pleasant surprise" (Tolson, 2004). The New Oxford Dictionary of English defines serendipity as the occurrence and development of events by chance in a satisfactory or beneficial way, understanding the chance as any event that takes place in the absence of any obvious project (randomly or accidentally), which is not relevant to any present need, or in which the cause is unknown. Innovations presented as examples of serendipity have an important characteristic: they were made by individuals able to "see bridges where others saw holes" and connect events creatively, based on the perception of a significant link. The serendipitous can play an important role in the search for truth, but is often ignored in the scientific literature because of traditional scientific behavior and scientific thinking based on logic and predictability. Successful researchers can observe scientific results with careful attention to analyzing a phenomenon under the most diverse and different perspectives. They can question themselves on assumptions that do not fit with empirical observations. Realizing that serendipitous events can generate important research ideas, these researchers recognize and appreciate the unexpected, encouraging their assistants to observe and discuss unexpected events. Serendipity can be achieved in groups where a 'critical mass' of multidisciplinary scientists work together in an environment that fosters communication, establishing the idea that the work and the interest of a researcher can be shared with others who may find a new application for new knowledge. Various thinkers discuss the role that luck can play in science. One aspect of Walpole's original definition of serendipity, often missed in modern discussions of the word, is the need for an individual to be "sagacious" enough to link together apparently innocuous facts in order to come to a valuable conclusion. Indeed, the scientific method, and the scientists themselves, can be prepared in many other ways to harness luck and make discoveries. M. E. Graebner describes serendipitous value in the context of the acquisition of a business as "windfalls that were not anticipated by the buyer prior to the deal": i.e., unexpected advantages or benefits incurred due to positive synergy effects of the merger. Ikujiro Nonaka points out that the serendipitous quality of innovation is highly recognized by managers and links the success of Japanese enterprises to their ability to create knowledge not by processing information but rather by "tapping the tacit and often highly subjective insights, intuitions, and hunches of individual employees and making those insights available for testing and use by the company as a whole". Serendipity is postulated by Napier and Vuong (2013) as a 'strategic advantage' with which a firm can tap its potential creativity. Serendipity is a key concept in competitive intelligence because it is one of the tools for avoiding blind spots (see Blindspots analysis). Serendipity is used as a sociological method in Anselm L. Strauss' and Barney G. Glaser's Grounded Theory, building on ideas by sociologist Robert K. Merton, who in Social Theory and Social Structure (1949) referred to the "serendipity pattern" as the fairly common experience of observing an unanticipated, anomalous and strategic datum which becomes the occasion for developing a new theory or for extending an existing theory. Robert K. Merton also coauthored (with Elinor Barber) The Travels and Adventures of Serendipity which traces the origins and uses of the word "serendipity" since it was coined. The book is "a study in sociological semantics and the sociology of science", as the subtitle of the book declares. It further develops the idea of serendipity as scientific "method" (as juxtaposed with purposeful discovery by experiment or retrospective prophecy). William Boyd coined the term zemblanity to mean somewhat the opposite of serendipity: "making unhappy, unlucky and expected discoveries occurring by design". A zemblanity is, effectively, an "unpleasant unsurprise". It derives from Novaya Zemlya (or Nova Zembla), a cold, barren land with many features opposite to the lush Sri Lanka (Serendip). On this island Willem Barents and his crew were stranded while searching for a new route to the east. ↑ "Words hardest to translate – The list by Today Translations. Also defined in modern times as "An unexpected discovery occurring by design". Unknown reference updated on 12/14/2014 by Isaac Lucero, Santa Fe, NM USA". Global Oneness. 21 April 2009. Archived from the original on January 25, 2009. ↑ Barber, Robert K. Merton, Elinor (2006). The Travels and Adventures of Serendipity : A Study in Sociological Semantics and the Sociology of Science (Paperback ed.). Princeton, NJ: Princeton University Press. pp. 1–3. ISBN 0691126305. ↑ Napier, Nancy K., and Vuong Quan Hoang. "Serendipity as a strategic advantage?." Strategic Management in the 21st Century; edited by Timothy J. Wilkinson., 2013, 1, 175–199. ↑ Serendipity in Competitive Intelligence by Yves-Michel Marti, Egideria Archived August 27, 2011, at the Wayback Machine. ↑ (a) Sommer, Toby J. "'Bahramdipity' and Scientific Research", The Scientist, 1999, 13(3), 13. Merton, Robert K.; Barber, Elinor (2004). The Travels and Adventures of Serendipity: A Study in Sociological Semantics and the Sociology of Science. Princeton University Press. ISBN 0-691-11754-3. (Manuscript written 1958). Hannan, Patrick J. (2006). Serendipity, Luck and Wisdom in Research. iUniverse. ISBN 0-595-36551-5. Roberts, Royston M. (1989). Serendipity: Accidental Discoveries in Science. Wiley. ISBN 0-471-60203-5.